The Clinton Global Initiative, Bill Clinton's annual philanthropy summit, held in New York, runs through Wednesday. The meeting has become a popular gathering for heads of state, business leaders, and celebrities and typically draws billions of dollars in philanthropic gifts and other charitable commitments. This year’s featured speakers include the actor Matt Damon, representing the charity he co-founded, Water.org; Laurent Lamothe, prime minister of Haiti; and Judith Rodin, president of the Rockefeller Foundation. 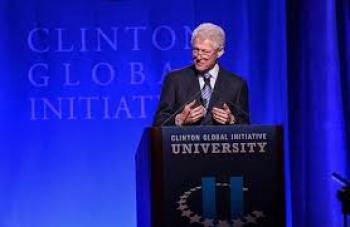 Since it was established in 2005, the Clinton Global Initiative has drawn more 180 world leaders and more than 2,900 commitments worth an estimated $103-billion. The meeting is live streaming its sessions, which you can watch below on this page, along with a running feed of announcements and select Tweets from the event. $6-million noncash support from Direct Relief, Last Mile Health, Wellbody Alliance, and Africare to airlift 100 tons of medical supplies to West Africa to combat the Ebola outbreak. $4-million from the FHI Foundation and FHI 360 to study how to improve international-development projects across different fields. $3.2-million from the Lumina Foundation and $3-million challenge grant from Cisco to the National Service Alliance for its Service Year program, which encourages young adults ages 18 to 28 to embark on community service for a year.